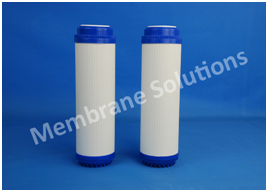 MS Granular activated carbon cartridge filter could remove sediment, chlorine, taste, odor and organic contaminants effectively from water, because each particle of the filter element has full contact with the solutions, thus ensuring the maximum adsorption capacity. The solution enters from one end of the filter element, through the whole activated carbon bed and from the other end of the filter when used. The unique designs of internal construction can maximum reduce the bypassing of liquid, the accuracy of the 10 micron rear filter layer can reduce carbon and other particles discharge effectively. The product can be effectively used for drinking water filtration under different sizes and flow rates.